Gov. Roy Cooper unveiled a $23.5 billion budget proposal Wednesday that includes sweeping investments in teacher pay, early childhood education, teacher scholarships and classroom support while, eventually, phasing out North Carolina’s controversial private school voucher program. 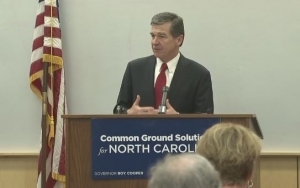 “We are catching up with investments in education, all the way from birth through community colleges and universities,” Cooper told reporters Wednesday at Durham Technical Community College. The plan, which increases overall spending by about 5 percent, includes a host of sweeteners for public school advocates who have long criticized Republican leadership in the N.C. General Assembly for their K-12 spending priorities. That includes, as promised, a 10 percent increase in teacher pay over two years for all North Carolina teachers, a rate the governor says would bring the state to tops in the southeast in three years. Cooper’s office says the plan would bring the state’s teacher pay at least to the national average by five years. The governor, meanwhile, acknowledged GOP lawmakers in the legislature have already announced their own plans to raise teacher pay to an average of $55,000 this year. Cooper’s proposal would also lift principal pay by an average of 6.5 percent, heeding advocates’ complaints that North Carolina principal pay is among the worst in the nation. Early childhood education, touted by some for its long-term academic impacts, particularly for low-income students, gets a lift too. Cooper’s budget creates another 4,700 state-paid Pre-K slots for at-risk children, and adds another $15 million to the Smart Start Program, a state partnership that helps parents pay for child care, access preventative health care and improves early childhood education. Meanwhile, in what’s sure to be one of the most debated elements of the governor’s plan, the budget would eventually end the state’s controversial investment in private school vouchers through the so-called Opportunity Scholarship Program. While school choice advocates, including a handful of Democrats, defend vouchers as offering an alternative for low-income children, Cooper and a number of public education advocates have been bitingly critical of the use of public dollars for private, mostly religious schools, some of which hold anti-LGBTQ admissions policies. The governor’s budget would fund the program through this year and next, delivering on already promised scholarships, but would nix a plan by lawmakers in the GOP-controlled N.C. General Assembly to raise the state’s investment in vouchers by $100 million over the next decade. “I believe there should be a phase out of this where we can get our money in public education, where we have more accountability and where more students can benefit,” said Cooper. Another major component would launch what Cooper is calling the N.C. Best & Brightest Forgivable Loan. Modeled after the GOP-scuttled Teaching Fellows Program, the new program would provide $10,000 forgivable tuition loans in exchange for a commitment to teach in a state public school for four years after graduation, or three years at a low-performing or low-wealth school. It’s a nod to North Carolina’s increasing difficulty recruiting top-notch educators, with officials reporting jilted teachers leaving the state or the profession altogether. Experts have also warned about plunging interest in teaching degrees in the UNC system. Cooper’s budget also makes direct overtures to other long-standing K12 advocates’ complaints, investing $13 million in textbooks and digital supplies and injecting $10 million each year into coaching and support in North Carolina’s lowest-performing school districts. The governor’s office notes the spending package budgets $20 million in “flexible” funding, which can be used to hire nurses, teaching assistants, behavioral counselors and assistant principals. “That’s so superintendents can put the money where they need it in their districts,” said Charlie Perusse, budget director for Cooper. Additionally, acknowledging the long-standing reality of teachers having to purchase their own classroom supplies, Cooper’s spending plan sets aside more than $14 million to be used for $150 stipends to offset teachers’ out-of-pocket costs. 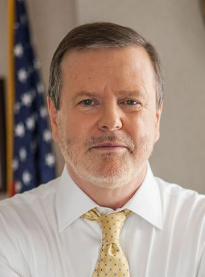 As expected, Cooper’s budget received a rocky reception from Republican leadership in the General Assembly, according to media reports Wednesday.